Studio dancers and teachers everywhere owe a debt of gratitude to Taffy Epstein, who based her costume company and line of coast-to-coast dance retail stores on the then-radical ideas of style, quality, and convenience. She died June 10 at age 92. Epstein was born Harriett Gombossy on July 20, 1920, in Akron, Ohio. “Taffy’s place,” the Epsteins’ daughter, Susan Epstein, told Dance Studio Life. Taffy Epstein, a woman with impeccable style and an indomitable “Auntie Mame” attitude, plunged in. In the days when leotards were unshapely cotton garments and many dance students sported recital costumes sewn by their moms, Epstein demanded well-designed, top-quality garments. One Taffy’s store expanded to become a chain of 14, from Seattle to Dallas to New York City. Taffy’s was the first retail distributor of Danskin tights, Susan Epstein said, and the first to design and sell dance dresses. 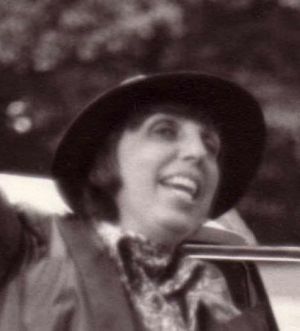 To support studio industry retailers, Taffy Epstein worked toward the creation of the United Dance Merchants of America. She hired innovative employees and listened to them, threw legendary parties, feverishly followed the Cleveland Indians, and never stopped taking risks. 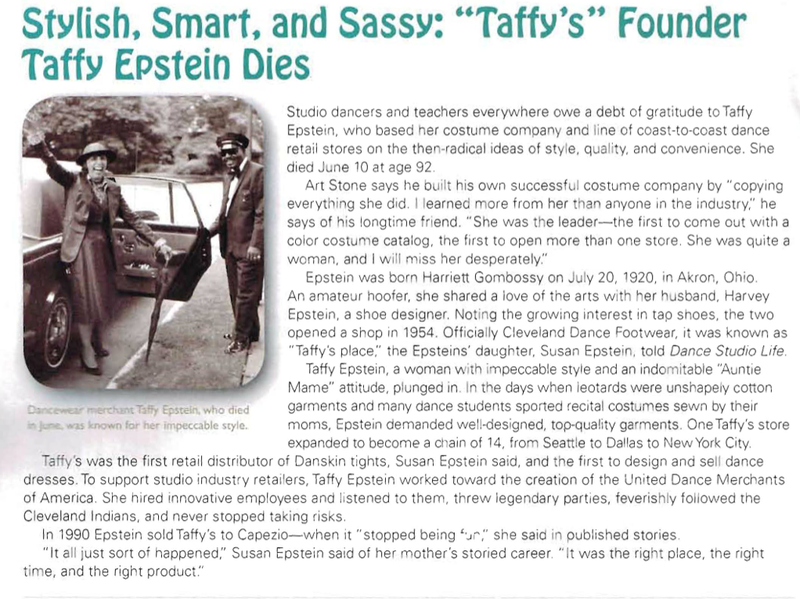 In 1990 Epstein sold Taffy’s to Capezio– when it “stopped being “fun,” she said in published stories. Taffy was born Harriett, not that she liked it. As soon as she became Taffy, her strangely spelled name was forgotten (apparently Great Grandma Gertrude – aka Gigi – didn’t know how to spell it). Even her obituary ran as Taffy … in the paper. The paid one at least. There was an editorial as well calling her “Taffy” in quotes. Aka Harietta. Surely this is just one typo. Nope. Four different mentions of ‘Harriett’, and four different spellings. I promptly reported it and they assured me they’d fix it right away. 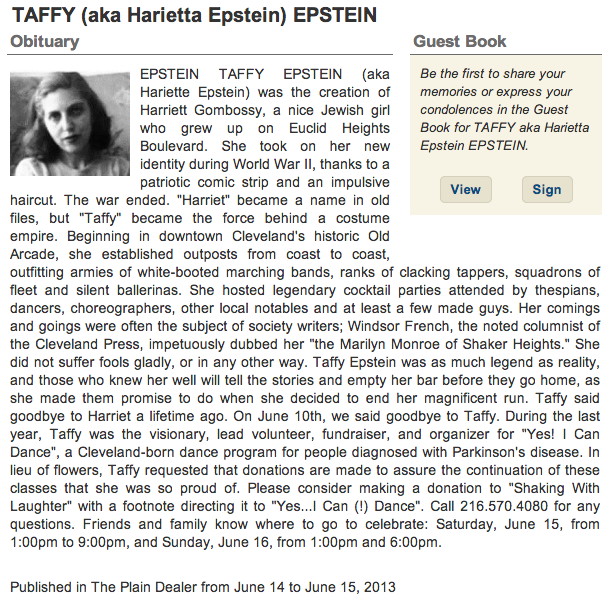 Taffy Epstein, founder of the famous Taffy’s Inc. dancewear store and “simply someone who took everything from life and lived it to the fullest point” according to her family, died June 10. She was 92. 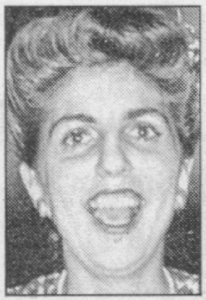 Born on July 20, 1920 in Akron, Ohio, Epstein (nee Harriett Gombossy) graduated from Cleveland Heights High School and Miami University, reported the Cleveland Jewish News. From humble beginnings in a small dancewear store in Cleveland’s Arcade in 1954, Epstein made Taffy’s a nationwide dance boutique, with 14 retail locations from Boston to Atlanta to Dallas to San Jose. Taffy’s changed the face of the dancewear business by offering color samples of pre-sewn costumes. When her flagship retail store opened up in New York at 57th and Broadway, her daughter called to tell her, “Mom, your name is up on Broadway.” Epstein accomplished all this while raising two children as a single mother. After selling Taffy’s to Capezio in 1990, Taffy started a take-out delivery service called Dinner is Served. In 2011, when Epstein learned that a dear friend’s daughter had been diagnosed with Parkinson’s disease, she single-handedly raised enough money to start the Yes…I Can (!) Dance program at the Mandel JCC in Cleveland. A life-long Clevelander, Epstein is survived by her son Steve Epstein of Ageo, Japan; daughter Susan Epstein of New York City; and grandchildren Mika and Boone Epstein. In lieu of flowers, the family requests donations to Shaking With Laughter (www.shakingwithlaughter.org) with a footnote directing it to Yes…I Can (!) Dance. 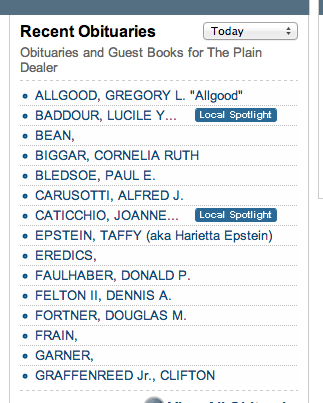 To see the full obituary, visit http://www.clevelandjewishnews.com/life_cycles/deaths/obituaries/article_fbbdbeee-d2c8-11e2-8a8c-001a4bcf887a.html. CLEVELAND, Ohio — The uninhibited Harriett “Taffy” Epstein created a nationwide chain of dance supply stores, hosted top performers at her apartment in Shaker Square and was booted from a convent hostel for returning at 3 a.m. with peals of laughter. Epstein died June 10 at University Hospitals at age 92. Her similarly uninhibited children reported her cause of death as “the Indians-Tigers series June 6-9”— a stretch when her beloved Indians seemed to die. Epstein usually avoided her name and went by plain “Taffy”. She built a chain of 14 “Taffy’s” stores across the country. 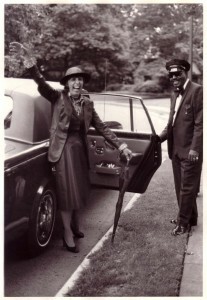 She sold tights, tu-tu’s, tap shoes, tiaras and records to dancers. She sold white boots to majorettes and marching musicians. She sold pasties and G-strings to strippers. Columnist Winsor French extolled Epstein in the Cleveland Press as “the Marilyn Monroe of Shaker Heights,” even though she lived just across the border in Cleveland. According to her children, Epstein often hosted stars such as Rudolph Nureyev, George Balanchine and Alan Alda. Her son, Steven, said he would bring home a date to find his mother and Dorothy Fuldheim, who lived across the hallway, wearing negligees and sipping Scotch. She was raised Harriett Gombossy in Cleveland Heights and went to Heights High School. She became a passionate Indians fan and joined a group of like-minded women called the Base-Belles. A born saleswoman, she peddled hose by mail while young. She also took dance lessons. At Miami University of Ohio, a stray field hockey ball injured her mouth, causing an infection and leading her to drop out. Back home, she worked for an uncle’s Majestic Specialties clothes and became a certified public accountant. She married Harvey Epstein and followed him to Air Force bases around the country during World War II. She happened to cut her hair short the same day that Taffy Tucker of the comic strip “Terry and the Pirates” did likewise. A nickname arose and stuck. The Epsteins raised a family in the Cleveland half of the Ludlow neighborhood and later in Shaker Square. She worked full-time meanwhile for an accounting firm downtown. Harvey worked in the shoe business and happened to hear that dance shoes were sold just in department stores. He thought a new career for Taffy might make it easier for her to raise the children. Back then, most dancers got costumes one at a time from parents or seamstresses. Epstein sent colored postcards to dance teachers around the country offering ready-made costumes instead. She got 100 orders at first, and the business quickly grew along with dance, popularized by TV and the fitness movement. She sold with style. She hired dancers to try out costumes and pose in them for catalogue photos with smoke and other special effects. She had many setbacks, including a strike and a flood at the factories she used. Once a bat flapped its way out of a shipment sent to a horrified teacher. But nothing fazed Epstein. She opened stores in Parma, Seattle, Salt Lake City and elsewhere. She opened one on Broadway in Manhattan and another across from her inspiration, Neiman-Marcus, in Dallas. In 1959, she helped found a trade group, United Dance Merchants of America and became its secretary. The divorced woman traveled widely for work and pleasure, which once made her too late and loud for a convent hostel outside Florence, Italy. Even at her chain’s peak, Epstein opened all the mail herself. Yet she had no office or even desk. In 1990, Epstein sold the business to Capezio. She promptly founded Dinner is Served, a delivery service that worked with 11 restaurants in eastern suburbs. She struggled in later years with her heart, eyes and ears, but remained active. In 2011, the nonagenarian launched Yes… I Can (!) Dance, a program for people with Parkinson’s disease affiliated with a nonprofit called Shaking With Laughter. Susan Epstein, one of the entrepreneur’s two children, worked for Taffy’s and has stayed in the field, co-directing shows for the Dance Merchants. Survivors: Children, Steven of Ageo, Japan and Susan of Manhattan, N.Y., and two grandchildren. Contributions: Shaking With Laughter, 2683 W. St James Pkwy 44106, shakingwithlaughter.org/donations-tickets.